For many, the photography studio can be likened to a sort of “chamber of dreams.” It is a space in which people can experiment with and perform different aspects of themselves both real and imagined. 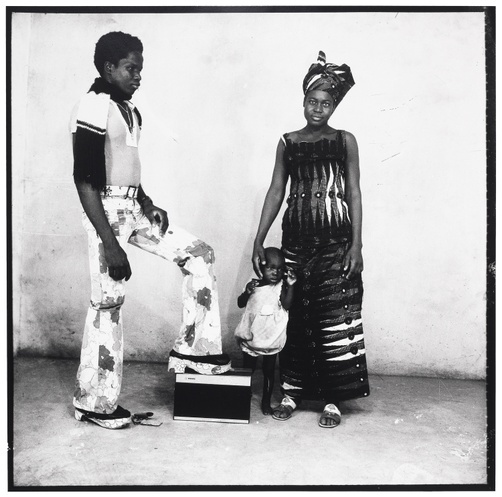 (1) For Malian photographer Malick Sidibé, who moved fluidly between the streets, dance halls, parties, and his studio in Bamako throughout the 1950s, 1960s, and 1970s, the photography studio was also a place where people arrived with intention and created one-of-a-kind memories. Many did so by calling forth something special of themselves, with Sidibé’s urging and keen eye, onto the studio floor and out in front of his lens so that he could capture their energy and that essential element that made each person stand apart from the crowd. Making certain each sitter’s personality was evident in every photograph was critical for Sidibé. “People who have life need to be positioned [in a certain] way,” he has said. (2) His aim, therefore, was to create portraits that reflected the inner lives of his clients and ultimately provided each person with images that she/he could look back upon and be reminded of the beauty of her/his life. Over the course of the last six decades or more, Malick Sidibé focused particularly on capturing the lives and leisure activities of young people in and around Bamako during the period of independence when the country’s political, economic, and social landscape was shifting and transitioning quickly. The youth at this time were discovering a whole new world and in this historical moment they embraced not only their own changing culture but also the music, style, and political ideologies of the broader African diaspora. Sidibé believed that the young people of Bamako were the pulse of his country and that they embodied its future. With this unwavering passion, he photographed people both in public and private spaces as well as in the studio, essentially and perhaps unknowingly creating an enduring and lasting archive and social history of Bamako popular culture and public life. Christopher Pinney, Camera Indica: The Social Lives of Indian Photographs, Chicago: University of Chicago Press, 1998. Malick Sidibé, interview by Jerome Sother for www.gwinzegal.com, Rouen, France, 2008; reprinted in LensCulture, https://www.lensculture.com/articles/malick-sidibe-interview-with-malick-sidibe, n.d.
Scholar and curator Isolde Brielmaier is Assistant Professor of Critical Studies in the Department of Photography, Imaging, and Emerging Media at Tisch School of the Arts at New York University. She holds a Ph.D. in art history from Columbia University. Brielmaier’s areas of scholarly interest include: global visual culture; race, gender, class studies; social media; technology; contemporary patronage and artistic practice; and the ongoing dynamic between art, artists, and the international art market, as well as the public and private sectors. Originally published in Accelerate: Access & Inclusion at The Tang Teaching Museum 2 (2018). Brielmaier, Isolde. “Isolde Brielmaier on Malick Sidibé, Des chaussures pour aller danser, 1963.” Tang Teaching Museum collections website. (https://tang.skidmore.edu/collection/explore/49-isolde-brielmaier).